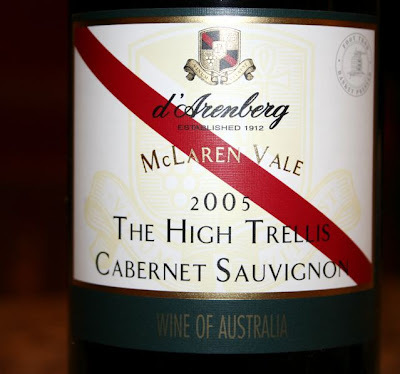 I just acquired a case of the 2005 High Trellis cabernet sauvignon from d’Arenberg and I had to pop a bottle open this evening. I liked it! It was one of those Australian fruit bombs that didn’t taste fake. It was not cloyingly sweet. It had structure and complication and interesting flavors. It also had a deep deep red color that I can only describe as blood with a bit of a purple hue. See the picture below. It had fantastic color. Of course you need to know how it tasted. d’Arenberg is a favorite of mine. I like most of the wine they produce and this one was no exception. On the nose I smelled chocolate covered dark cherries an blackberries. There were wisps of black current and a hint of leather. On the palate you were immediately attacked by huge dark cherry flavors that mingled with leather, tobacco, wood and cocoa. The mid palate was exciting and the wine had a rich flavor that weighted heavily on the palate. Currant and mulberry flavors danced along on the lingering finish. There was an interesting note of cowhide that reminds me of chewing on a leather shoe lace on a pair of work boots. It was a big fruit bomb but nicely balanced. If I were to score it I’d say it was a 90 point wine. We opened another bottle this evening from California. The 2004 Bogle Phantom. 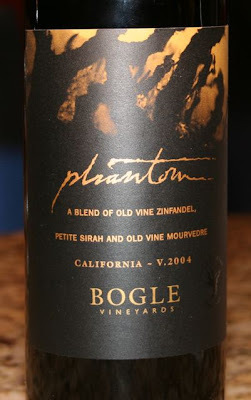 This is a meritage blend of 54% Petite Sirah, 43% old vine zinfandel and 3% old vine mourvedre. If you like petite syrah you’ll like this wine. The zin gives it a spice that is very interesting. It displayed black currants, raisins and spice on the nose. On the palate it was big, jammy and spicy. 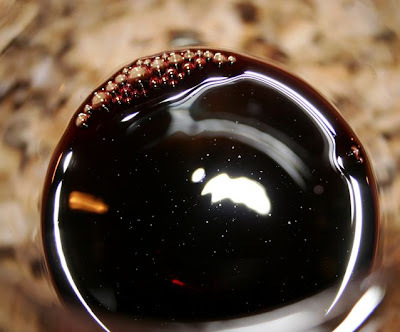 It had a lush dried fruit component that reminded me of chocolate covered raisins, dried figs, currants and prunes. The chocolate really came out on the mid palate. One the end there were flavors of mocha, black dirt, vanilla, a tiny trace of cumin and coffee. A quite interesting wine. It developed more as it was allowed to breathe. Definitely worth the $17 I paid for it.